Meatza is a revolutionary thing at our house. 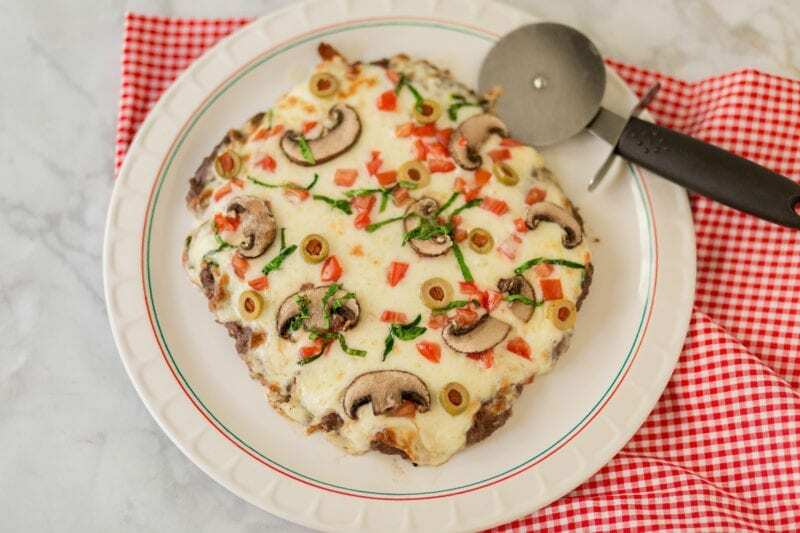 It tastes a little like meatloaf and pizza all smooshed into one. I happen to love both of those dishes so it is a total win for me! It also solves a seriously fruuuuuustrattttttiiiiiiing issue around dinner time. My kids love all the carbs. My husband is accidentally Keto. (As in he prefers eating that way but doesn’t freak out if he has a grain of rice. But he craves protein the way I crave cake. Yes, it is totally weird to me too.) Generally speaking he will eat a piece or two of pizza, then complain about how sluggish he feels. While that is happening, my 3 daughters and I are killing an extra large 3 cheese pizza and waiting for the food comma to set in. We all love Meatza! All of us except the youngest love this dish… she is not crazy about meat at all so it has nothing to do with the dish and everything to do with being 5. She prefers noodles and white bread at this point in her life but we’re working on her. 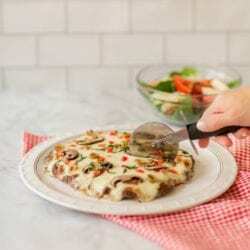 So we serve Meatza, the magical Keto pizza a couple of different ways. The first is on its own with a side salad and some rolls for the kids. 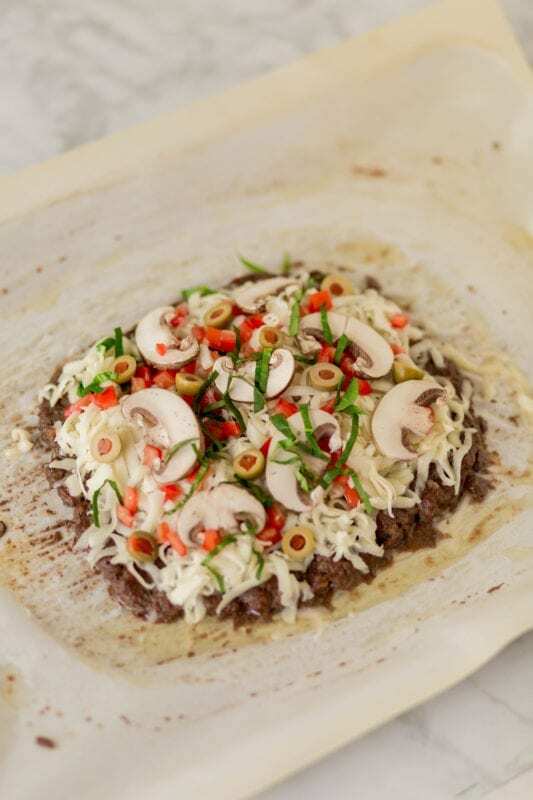 When we are all really craving traditional pizza, we plan pizza night at home and meatza to the collection of pizzas it takes to feed our family and all the friends they invite over. So the kids get the real deal. And the low carb adults get a pile of meaty goodness with their favorite sauce and stretchy cheese. 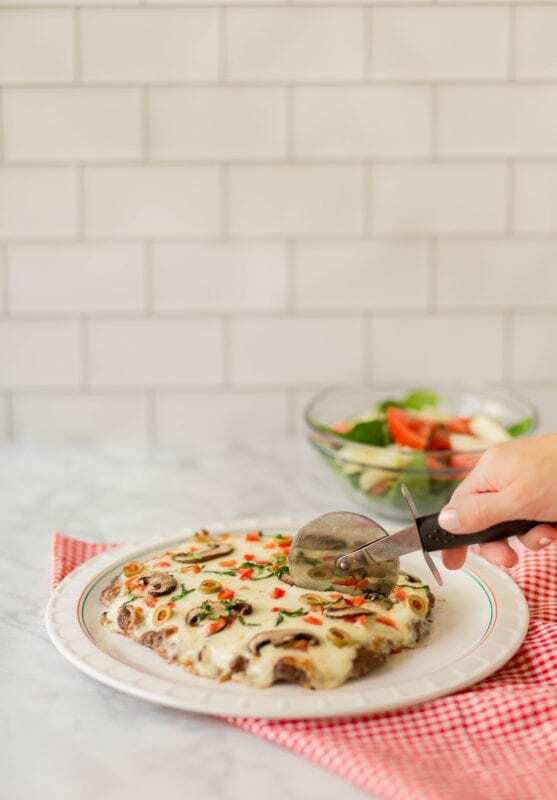 We actually love serving Meatza with a veggie top because there is already meat in the dish. Mushrooms, onions, peppers, olives, pick your favorites! But I have to admit we have tried it with crumbled bacon on top and shredded chicken and both were delicious! Mix meat ingredients in a bowl. On a cookie sheet lined with parchment paper press and flatten the meat "dough". I make mine about .5 inch thick and make it a little bit large, as the meat will shrink about an inch in diameter once cooked. Remove from oven and add your toppings, starting with the pizza sauce. This is the part where you can, of course, be very creative! Or add your favorite pizza ingredients. Bake again for an additional 15 minutes, or until cheese is all melted and gooey. 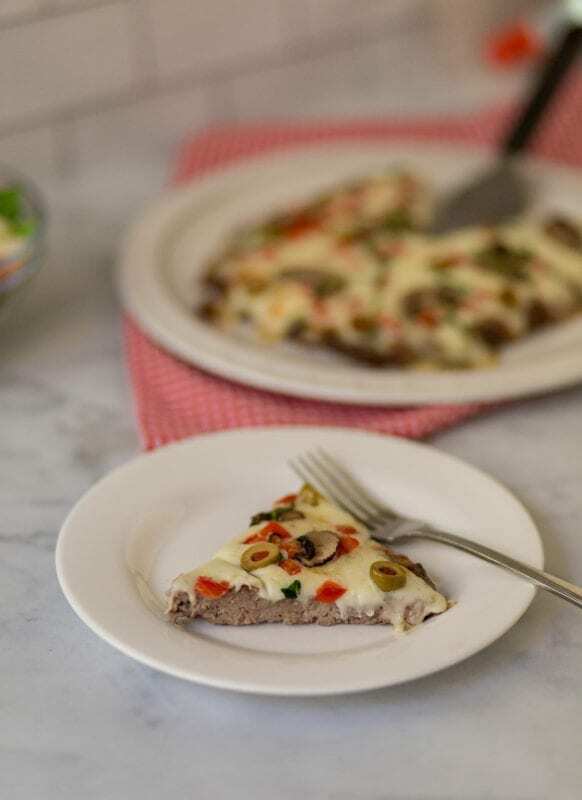 Don’t forget to follow up your Meatza with one of these AWESOME Keto cheesecake recipes! Previous Post: « Kitchen Menu Board to save your sanity!